Elenir didn’t send a photo, but I can only imagine how busy a small powder room with etched stripe mirrored walls would look! But as far as how to disguise the walls, I’m a bit stumped. 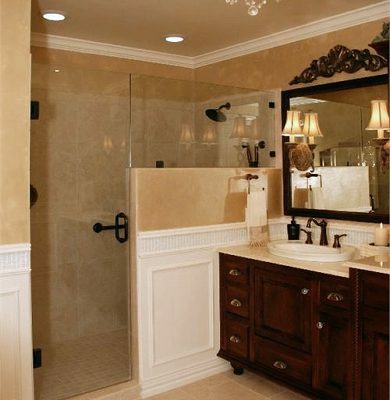 But I don’t think that would work on a mirrored wall with etched stripes, and certainly not in a small powder room. The idea of wallpapering over the wall sounds like the best option in my mind, but I’ve never used wallpaper paste over something like mirror, and I’m also not sure if a wallpaper liner would need to be used so that the etched stripes don’t show through. So, any advice for Elenir? Have any of you ever wallpapered over a glass surface before? It think painting over them would be the least viable option unless the entire surface of the mirrored walls were etched first so that the paint would adhere, and I can’t even begin to imagine how costly that would be!!! Update: Elenir sent a photo of her powder bath with the striped mirrored walls. Update: Y’all really came through with your suggestions, both here and on the A2D Facebook Page! Elenir wanted me to give you a big, “THANK YOU ALL!! !” It looks like she’s going to try Mary’s suggestion of priming the surface, wallpapering, and then painting over the wallpaper. Hopefully she’ll let us know how it turns out! Reader Question: How Do I Paint This Ceiling? Previous Post Q & A--Is It Okay To Mix Hardware Colors In A Room? I just covered small etched mirrors on a cabinet with beadboard … you can see it here: http://6dukes.blogspot.com/2011/09/bathroom-cabinet-redux.html. Not sure if that would work on an entire wall. Wallpaper might work but paint definitely won't because the etching will show through. Bless your heart, Elenir. Oof. I think the beadboard idea is a great one. You could also adhere wallpaper with the right adhesive. And while the stripes may show through a paint job, that might add interesting texture to the wall, too. If you don't mind the mirror, maybe etch the whole thing? 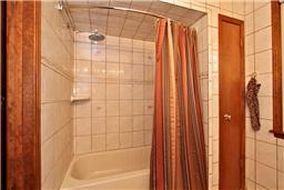 For the record, my bathroom growing up was wallpapered in an avocado/orange/cream/mirror plaid. Heinous. I attached fabric over mirrors with hot glue–worked pretty well and when I wanted a change, everything peeled right off the mirrors! I would think that you could paint them by scuffing it up with sand paper, then use a really good primer like Bin oil based and then paint. I'm pretty sure you can wallpaper grasscloth (a very textured wallpaper) over it. I remember my folks doing it over their old paneling–yes, I'm that old! You can also paint the grasscloth. Although beadboard would look nice straight on, it will add thickness that won't look right where it meets the counter or door frame. Better to use a a high adhesion primer, let fully cure and finish with a heavy paintable wallpaper in a simple pattern like reed grass or basket weave. It will have the benefits of solid colour but enough weight and texture to mask the etching. Before all that work I would try to use glass paint on a small area to see what that looks like. I bet it would give the effect of using gloss and flat paint on painted striped walls that so many use for a suble stripe affect. Embrace the stripes but with color instead of mirror… does that make sense? That makes sense to me, but I thought glass paint was translucent, and generally had to be baked on after application. I have a great suggestion that I have seen before but have never tried. You can put fabric on the walls very easily with liquid starch. You cut the fabric a couple of inches longer than the wall. Dip it in liquid starch or spray both sides with liquid starch (I've read both methods used) and then smooth onto the wall. After it dries go back and cut to exact size.